TORONTO—It’s not too often that Jean Stilwell steps on the opera stage these days, but when she does, audiences are in for a performance to remember. The Canadian mezzo-soprano follows her own path, bringing integrity, passion, and strength to the characters she plays. “Being on stage you have to tell her story, but you have to make it your story as well, [find] a deep part of who you are and put it into the character,” says Stilwell. The singer, who now spends much of her time as the host of “Good Day GTA” on Classical 96.3 fm, is performing this week in the Toronto Operetta Theatre’s (TOT) production of “Earnest, the Importance of Being,” by Canadian composer Victor Davies and librettist Eugene Benson. Based on the Oscar Wilde play “The Importance of Being Earnest,” the operetta opened in 2008 to a warm reception in Toronto, bringing light-hearted melodies—waltzes, tangos, marches, and ballads— to the stage as well as the comic spirit of the late nineteenth century British play. “If you know the play, Lady Bracknell is sort of a dragon woman. 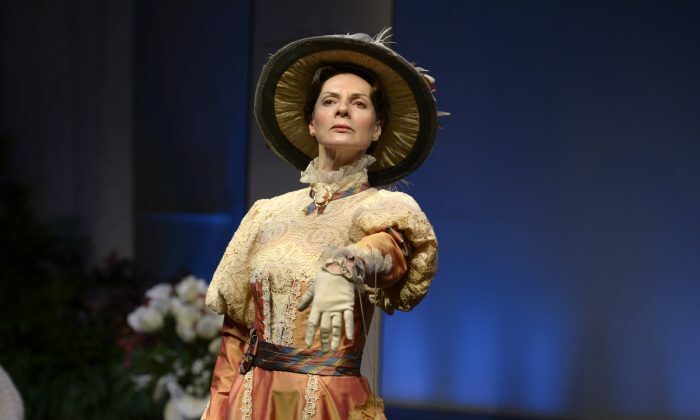 [She’s] a great, great character and all actresses just love to play her,” says the TOT’s marketing director Henry Ingram, who feels Stilwell has the right characteristics to portray Lady Bracknell. “She’s always been both onstage and offstage a larger than life personality,” he says. “She’s such a wonderful character, it’s joyous to play her onstage,” says Stillwell of the role. Lady Bracknell has had to work hard to get her social position and will do anything to protect that. In the operetta, as in the play, people laugh at her, but not with her, Stilwell explains. The singer believes there are similarities between herself, Lady Bracknell, and Carmen—the opera role that made her most famous. “I think I’m a survivor. I say that those women are survivors,” she says. “They’re strong women. They’re also very vulnerable women, and you need to have the ability to show that. And you’ve got to find that on your own—nobody can find that for you—to be able to show that to the audience,” she says.